Blitzball is the ultimate backyard baseball game! With its unique, patent-pending design, Blitzball gives players MORE curving action, speed, and Home Run distance than any other backyard baseball / wiffle toy! Weighing just under 1 oz. each, Blitzballs are safe enough for everyday backyard use and are proudly made in the USA from the highest-quality plastic polymers. Blitzball is the ultimate backyard baseball game! With its unique, patent-pending design, Blitzball gives players MORE curving action, speed, and Home Run distance than any other backyard baseball / wiffle toy! Weighing just under 1 oz. each, Blitzballs are safe enough for everyday backyard use and are proudly made in the USA from the highest-quality plastic polymers. Great fun (and practice) for players of all skill levels, Blitzball takes ordinary backyard baseball / wiffle games to a whole new level. Get yours today and DOMINATE your friends -- nothing moves like a Blitzball! 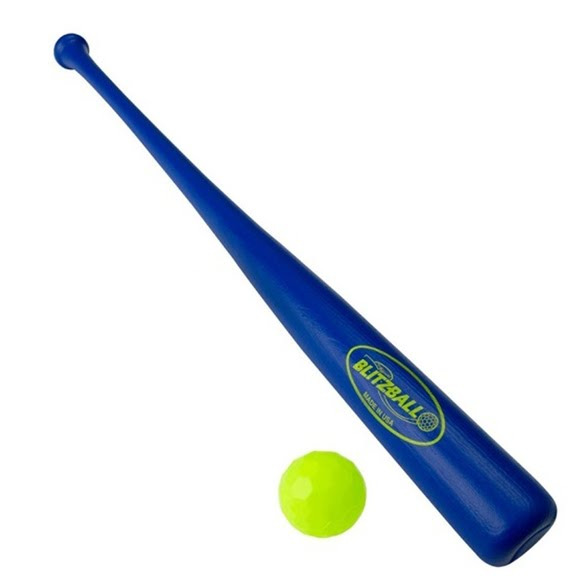 Includes one Blitzball and Blitzball Power Bat (can hit Blitzballs up to 200 feet)! Durable, high quality plastic bat: 33” with a major-league sized barrel head for a larger hitting surface and maximum power!